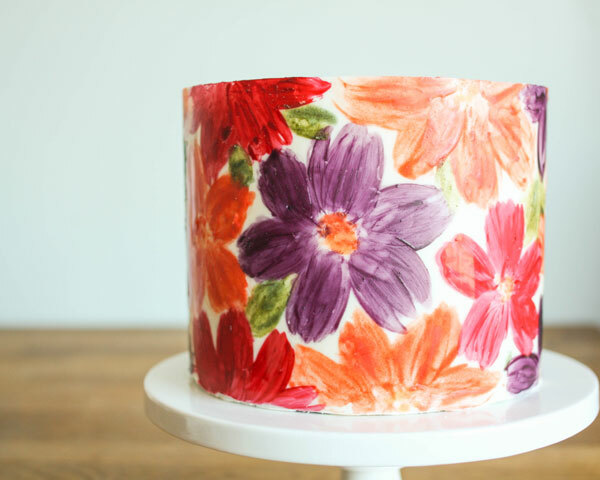 Chocolate Wrapped Cake – how to make a cake wrapped in chocolate, with a hand-painted floral pattern. A new tutorial by our contributor, Erin Gardner! Working with chocolate can be intimidating for some, but with a little practice and patience it really is a ton of fun! Creating a chocolate cake wrap is a classic pastry technique. Once you get the hang of it, the design possibilities are endless. Hand-paint, pipe, swirl, or even splatter a cool design. 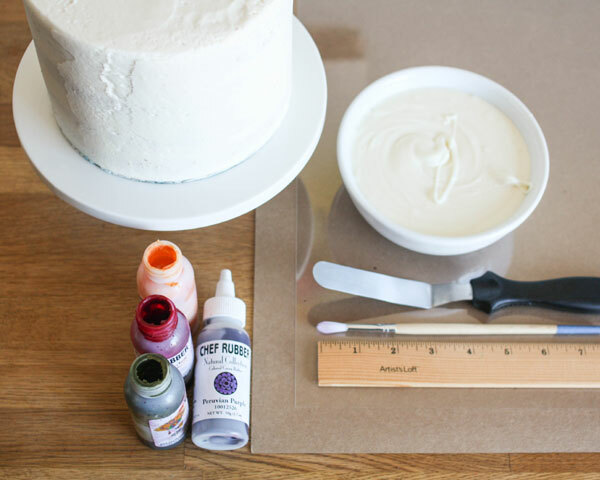 It’s an easy way to create a sophisticated, custom cake finish that tastes even better than it looks! 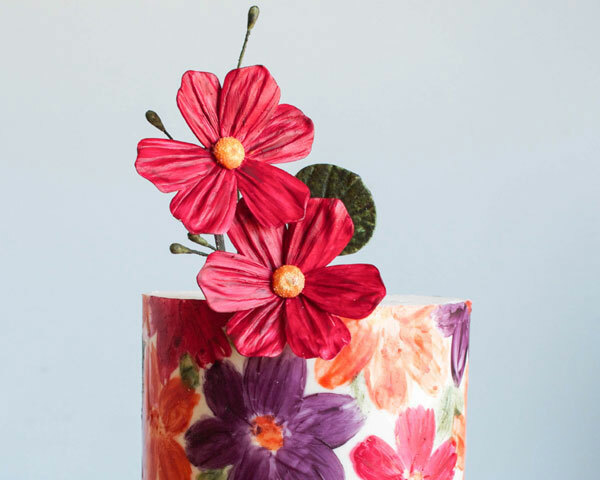 Today I’m going to show you how to make this chocolate floral wrap, creating a vibrant cake perfect for birthdays, showers, Valentine’s Day or even Mother’s Day. Acetate is the material of choice when working with chocolate. You can find it online or in specialty cake stores. It helps give your work a beautiful shine, is flexible, sturdy, and allows you to see your work as you go. If you don’t have acetate you can still use parchment paper to create a chocolate wrap. I would not recommend painting cocoa butter on parchment, but you could do a solid color or pipe on a design. 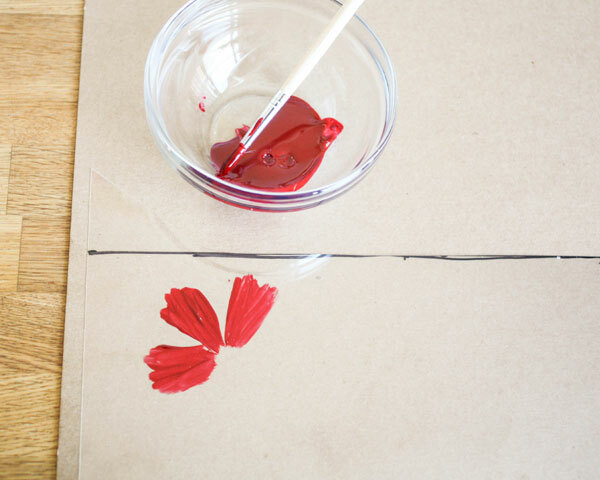 Using parchment paper will also give your wrap more of a matte finish. Find the circumference of your cake by multiplying the diameter x Pi (3.14). I used a 6-inch round cake, so my circumference was 6 x 3.14 = 18.84-inches. 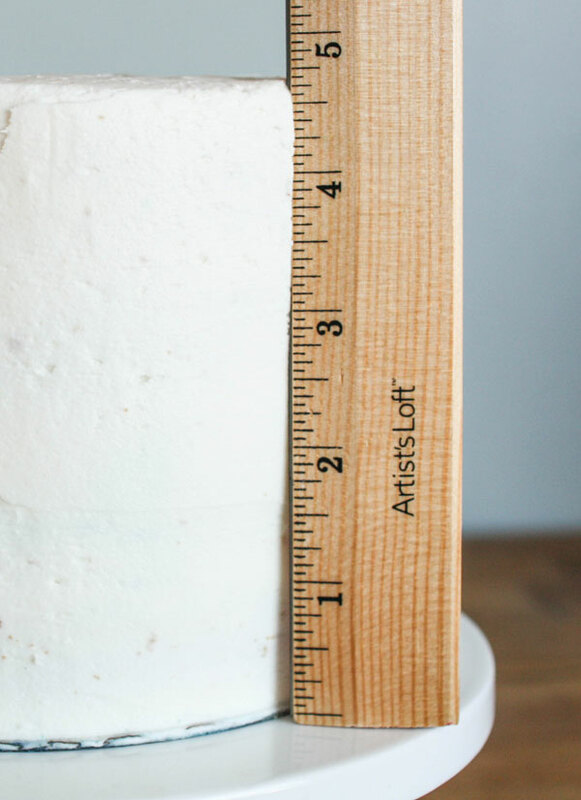 Measure the height of your cake using the ruler. 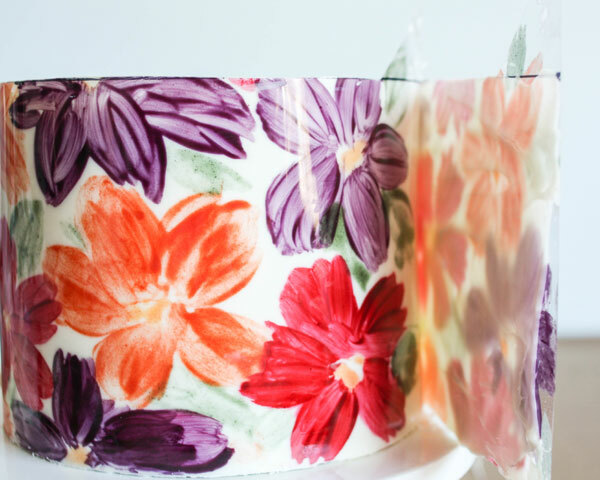 Cut the acetate strip so that it’s 1/4-inch winder than the height of your cake and 2 to 3-inches longer than the circumference of your cake. Leave little triangular flaps at either end of the piece of acetate to make it easier for you to move the strip around once it’s coated in chocolate. If your acetate strip is shorter than the circumference of your cake, tape pieces together until you get the length you need. 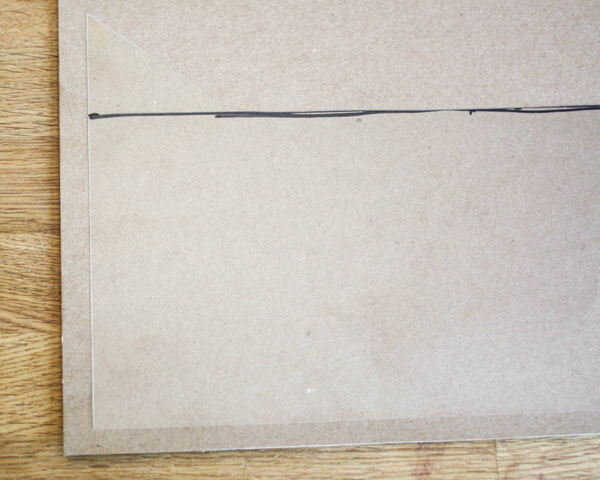 Flip the piece of acetate over so that you’re working on the clean side, and place it onto a piece of cardboard. This makes it easier to work with the strip and helps with clean-up later. Melt the colored cocoa butters and paint on your design. I free-handed very simple daisies and leaves, but you could use a template or pattern under the acetate as your guide. You could also use a pre-printed chocolate transfer sheet . I wouldn’t tell on you! 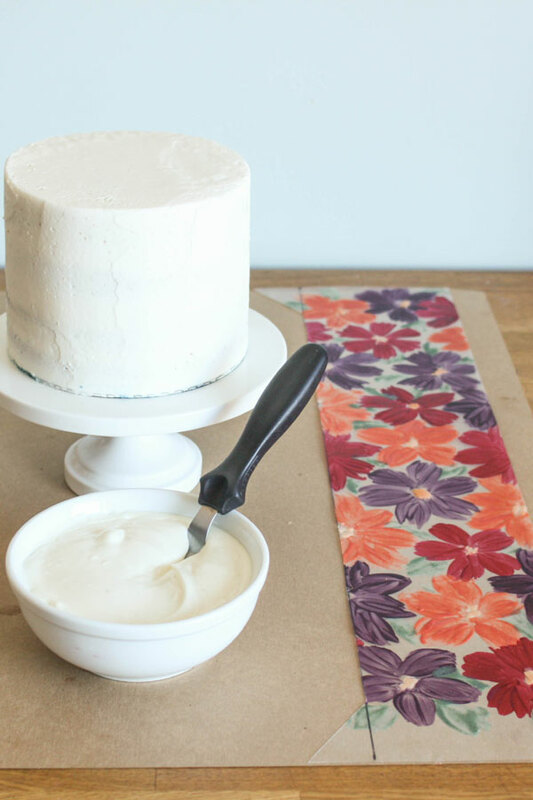 Before you finish the wrap, bring your cake out of the fridge and set it onto the stand that you’ll be serving it on. This works best on a stand with a smooth surface and no lip. 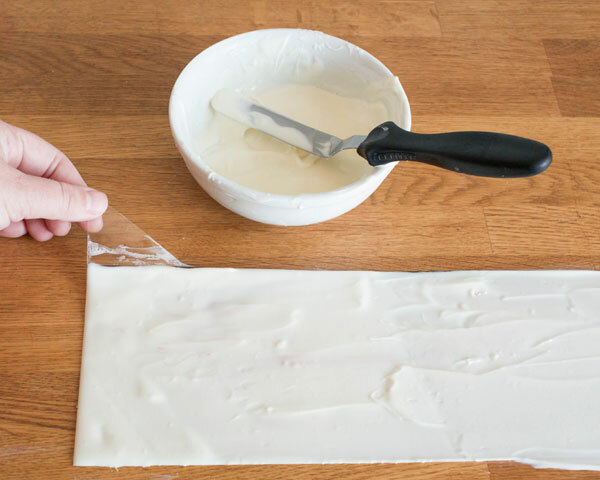 Pour melted white chocolate onto your design and spread it to the edges using your offset spatula. For this technique you do not need to temper the chocolate. It leaves you more time to work with the chocolate and will cut easier when ready to serve. Using acetate will help it keep some shine even though it’s not tempered. Allow the chocolate to set up for just a second to a few minutes, depending on how warm it is where you live. You want the chocolate to be firm enough so that it doesn’t run and ruin your design, but still flexible enough to bend around the cake. Finding this sweet spot can be a little tricky. You’ll see the surface of the chocolate go from wet and shiny to dull but still sticky. This is the perfect point to wrap your cake. Pick up the strip by the little flaps you left at the top. Place one end of the strip onto the cake and then lay the rest of the wrap around the cake. 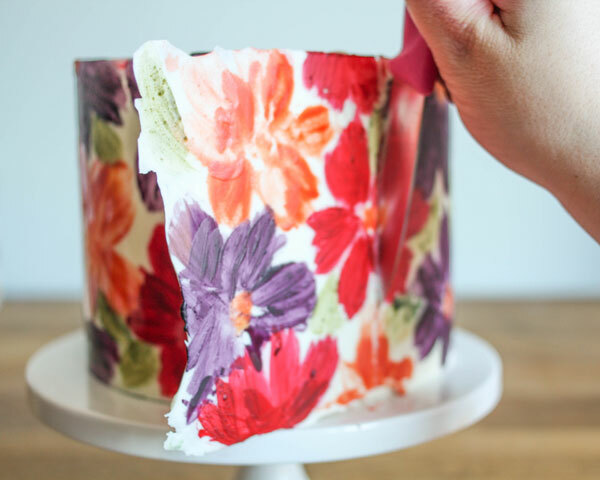 Don’t smush the wrap onto the cake with your hands, this might smear the design or crinkle the acetate. Instead, use the flaps to gently pull the wrap into place. To close the seam, press the wrap against the cake where the overage meets the beginning edge of the wrap. Let the rest hang out over the side of the cake stand. Place the cake into the fridge for about 20 minutes, or until the chocolate is completely set. Pull the cake from the fridge and gently take off the acetate. It should pull off very easily at this point. Warm up your knife by running it under very hot water or by heating it up with a blow dryer. Use the hot blade to trim away the excess chocolate. Score a line with the knife and run back over the line repeatedly until the chocolate is cut all the way through. Try and be very patient at this point, so that you don’t crack your wrap. If any part of your design chips, or doesn’t make it from the acetate onto the cake, you can go back in with your paint brush and touch up with more melted cocoa butter as needed. Fill in the top of the cake with more buttercream, chocolate, or ganache. Just make sure that whatever you fill in the space with isn’t warm enough to melt the wrap. I topped my cake with a few chocolate and cocoa butter blossoms, but this bright and cheery cake would be gorgeous as-is. It would also look beautiful topped with one of my chocolate flowers. The possibilities are endless! Wow! This is so pretty, love it! Hi, thanks so much cant wait to try it out…a quick question though i am just wondering if shortening could be used in place of cocoa butter. Incrível, amei! Seu blog é lindo parabéns você é muito talentosa! I love this technique so much. How do you keep the painted pattern from smearing when you spread the chocolate? This looks pretty. How do you cut the cake? Where I live we don’t have that type of cocoa butters, is there anything else I could use? Would it work out if I used a thin layer coloured chocolate to make the desing? 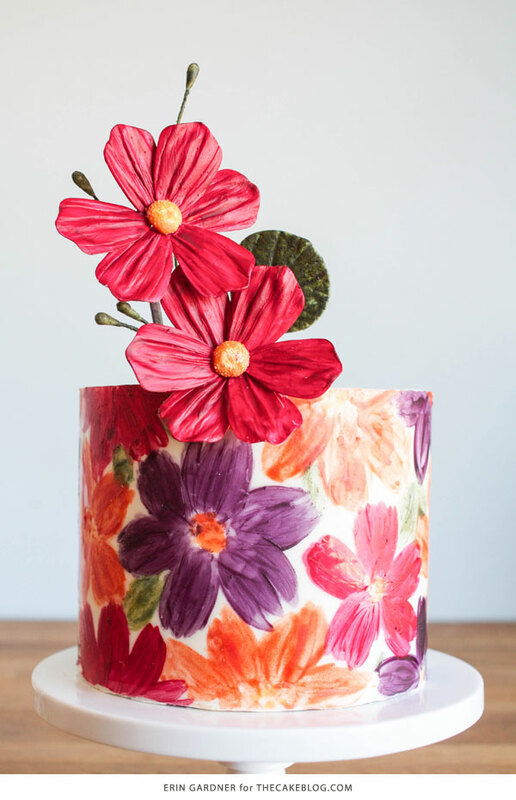 Just so I understand you painted right on the acetate with the brush using the frosting and then just smoothed it out so it’s thinner when making the flowers to make it a painted look? Wow, I love this. Am wondering how you attached the pretty red flowers. Is the green garnish behind the red flowers chocolate too? I saw your beautiful cake and want to make it. In May I had asked a question regarding spreading the white chocolate over the flowers but not sure I understand if you spread it right on top of the flowers or filled in between the flowers. You might have responded to my question and didn’t see your answer but I still want to make this beautiful cake but can’t until I understand that particular step. Look forward to your reply. 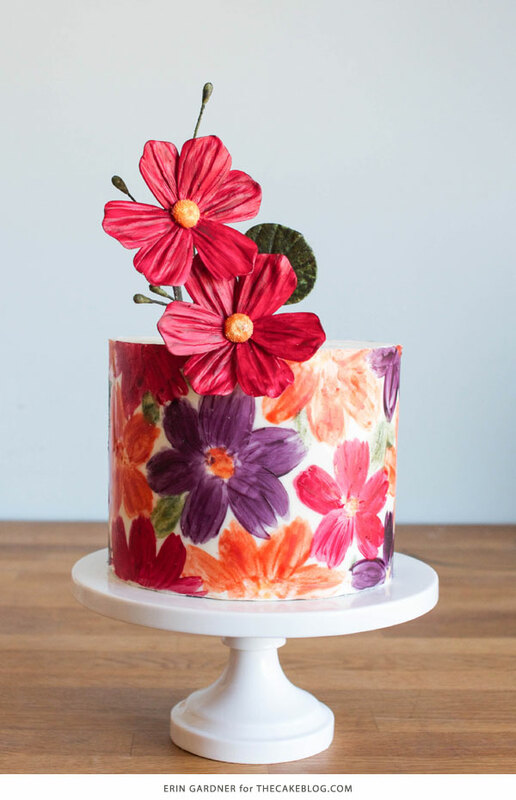 Yes, she painted right over the colored flowers with the white buttercream. You would not be able to spread in between. The colored candy hardens and the buttercream gently spreads on top. That’s white chocolate, not buttercream, on and over the flowers. You’re making a chocolate wrap for a cake, so it’s all chocolate. The frosting is on the sides of the cake (holds the chocolate wrap to the cake) and on top (decorative). It definitely takes a bit of practice to get the timing *just right* on the wrap placement. Good luck! Hi I love this idea. It’s so unique! ! It’s hard to find cocoa butter where I live is there anything I can substitute for this? Just tried this technique, I was excited because yours turned out so beautifully! Everything worked well but spreading the white chocolate smeared my painted design. It still looks great but wondering if you had any tips?